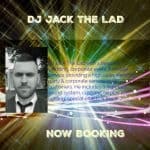 Introducing DJ Jack The Lad with a bespoke wedding, corporate event & mobile service providing a high class wedding, party & corporate service to all customers. He includes a high end sound system, customised play lists, lighting, special effects & booths. DJ Jack The Lad is one of the most sought after Disc Jockeys in the business specialising in weddings and corporate events. He also holds 3 different club residencies and numerous guest slots across the capital. With his ability to read the crowd and extensive music knowledge Jack the Lad has become a favourite at London’s V.I.P parties and corporate events. You will find him deeJing for the likes of Sony, Decca, Disney, Harrods, L’Oreal, BBC – at some of London’s landmarks including The Gherkin and Somerset House. Jack can play any style of music and can be found spinning multi genres in the same set as well as playing niche sets which has led to bookings for the Harry Potter cast and crew, BBC One Show, Bad Education cast and Tool Academy wrap party as well as the Got To Dance Final after-party. DJ Jack Music: with over 40, 000 songs and counting – 50s, 60s, 70s, 80s, 90. 00, Current, Cheese, Club Classics, Rock, Indie, Soul, Motown, House, Garage, Ska , Reggae, Irish, Bollywood, Bhangra, Spanish, Brazilian, Afrobeats, Soca – any niche genre can be covered given a few days notice. Venues & Clients: The Mondrian, The Rosewood, No1 Lombard Street, Somerset House, The I.C.A., East Wintergarden, The Waldorf, Dartmouth House, Royal Garden Hotel, Th Oval, Renaissance St Pancras, Mayfair Edwardian, The Lancaster, The Gherkin, BBC, Sony, Decca, Harrods, Disney, Harry Potter Cast and Crew, L’Oreal, Tesco, Marks & Spencer, Innocent Drinks, BBC One Show, MANY MORE.